Some (and I’m actually just looking squarely at you, FearDotCom) were silly, essentially treating the internet as an excuse to conjure up lame thrills; others, however, were thoughtful, unsettling explorations of how this technology could fundamentally alter our lives. None were more so than Kiyoshi Kurosawa’s Pulse, a meditative, ethereal snapshot of an empty, lonely world on the verge of the quietest—yet most unnerving—apocalypse captured on film. Like many films from the era’s concurrent J-Horror movement, Pulse isn’t in a hurry to spell out its story—hell, it doesn’t seem to be too insistent on spelling it all out, period. It takes on a familiar, bifurcated structure as Kurosawa patiently unravels a pair of parallel Tokyo stories. One involves a group of friends who encounter a bizarre series of events involving a mutual friend that drops off the grid for a few days. When they go to check on him, he seems to be fine, if not eerily quiet; still, everyone is shocked when he casually hangs himself, leaving behind nothing but a mysterious black smudge on the wall. He also leaves a computer disk containing some bizarre images that seem to suggest something supernatural is at hand, and his surviving friends are soon “infected” with the same strange, suicidal behavior. At the same time, computer newbie Ryosuke (Haruhiko Katô) is looking to connect to the internet for the first time and is greeted by an ominous message and a mysterious chat room. “Do you want to see a ghost?” is asks, before revealing multiple webcams peering in on users going about their business in silence. Confounded, he turns to a fellow college student named Harue (Koyuki) in a computer lab, who’s similarly at a loss to explain it with any conventional, technical explanation. Looking into the issue further eventually has her turning towards occult books, as the phenomena grow to be even more sinister and forlorn, prompting depressing thoughts of suicide. Somehow, these strange transmissions instill a deep, preternatural understanding that loneliness is eternal, even in death. Kurosawa’s handling of this dual narrative is arguably the most effective and clever. Early in the film, Ryosuke becomes fascinated by what appears to a simple computer program involving a group of dots floating about. Harue explains a graduate student programmed it as a simulation reflecting our universe, with the dots representing people. Stray too far apart, and they’re naturally compelled to pull back together; however, if they touch, they perish, creating the poignant conundrum of life: no matter how much we long for connection, we can never truly achieve it. Pulse’s parallel structure reflects this, as audiences watch these two sets of characters operate independently, straying apart from one another before eventually crossing paths, at which point destruction is imminent. That’s sort of the thesis of Pulse: that all of our attempts to connect are in vain and we’re doomed to wander both life and afterlife as listless spirits. Not even the internet—whose explicit purpose is to connect—will overcome this essential despair. Kurosawa imagines the ‘Net much like my Boomer parents once did: as a nefarious underworld, with horrors lurking around every click and drag. Bustling chatrooms are nowhere to be found; in their stead are these lonely, spookily quiet glimpses of individuals just toiling away. Given the advent of social media and its weirdly distancing effect, Pulse has only grown to be eerily prescient in this regard, as Kurosawa envisions a digital wasteland marked by isolation. It might be more accurate to say Kurosawa sketches that impression. Pulse is primarily a mood piece, one that thrives on an oppressive, bleak mood and indelible, unnerving images to instill that same sense of despair in its audience. 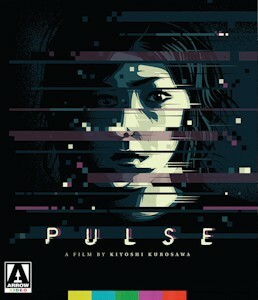 Knowing exactly what’s going on in Pulse is difficult since Kurosawa appropriately refuses to connect the dots, thereby doubling down on his insistence that true connections are impossible, perhaps making himself complicit; however, knowing exactly how Kurosawa wants you to feel isn’t nearly as elusive. Ranking among the most depressing films ever made, Pulse is an eerie reflection of its own narrative, which finds people unable to shake the deeply unnerving transmissions they encounter. None of them can exactly explain what it is they’ve seen—only that it fundamentally alters their perception to a disturbing degree. Likewise, Pulse feels less like a film and more like a transmission straight into your soul. Kurosawa’s script allows for elliptical suggestions—one of Ryosuke’s fellow students supposes that the internet has become a conduit for lost souls to roam back from the ether of the afterlife--but it otherwise remains a laconic narrative that resists total coherence. We see Tokyo residents boarding up rooms with red tape without a full explanation, while Harue’s investigation yields some askew revelations about how these transmissions work, thus creating the impression of a mythology to explain the bizarre events unfolding throughout Pulse. But again, requiring a fully-formed, logical mythology belies the point of Pulse. What it lacks in narrative coherence, it makes up for with tonal consistency. Kurosawa paints an unrelentingly bleak portrait of a world that’s become slowly undone by a stealthy plague. In keeping with his refusal to push every piece together, he seemingly plops viewers right into the middle of this outbreak, as Tokyo never buzzes with activity. Buses carry only a handful of passengers through eerily vacant streets littered with abandoned cars and husks of storefronts. In lieu of the hustle and bustle, there is only the phantom sensation of white noise: Pulse never rises above the tenor of a hushed whisper, almost as if Kurosawa were relaying the apocalypse around a campfire. Even the garbled cacophony of a 56k modem—which has sense become a cozy cultural relic—is rendered sinister amongst this constant, electronic hum. There’s no escaping the sense of being slowly (and paradoxically) suffocated beneath complete and utter emptiness: life becomes nothing but an endless series of black smudges and the faint remains of friends and family swirling about, emphasizing the vacuum they’ve left behind. No connections can be made, even as the film crowds into intimate interiors, where the spirits dwell. There’s nothing ambiguous about their presence: these ghosts are very much real, and they skulk about as stealthily as any other element in Pulse. Somehow completely natural (in that their presence doesn’t seem to startle anyone) and unnatural all at once, these spirits feel as though they’ve emerged right out of the woodwork, so to speak. While they only overtly appear in a handful of sequences, each glimpse is absolutely stunning yet subtle since Kurosawa remains committed to a low-key, creeping aesthetic. Even Takefumi Haketa’s score takes on the tenor of faint wailing here to amplify not only the terror but also the utter sadness lurking the ghost’s vacant, longing gazes. These aren’t the faces of malevolent spirits—just lost ones. That overwhelming melancholy is what lingers in the wake of Pulse, a film that’s terrifying in its existential implications. Everything about it—its elusive narrative, its detached, icy mood, the way Jun'ichirô Hayashi’s low-lit photography always seems to be devoid of vitality—has been exactingly crafted to capture the dread of our inevitable end. Whether the characters are seeking comfort in dingy, under-lit interiors or chasing hope under oppressively grey skies, a sense of futility follows. Escape is impossible, and Pulse—which is laconic enough to act as an inkblot test waiting for personal projection—is easily read as a metaphor for depression. No matter what these characters do, they’re unable to shake their confrontations with death and the realization that loneliness endures, even in a world supposedly crawling with networks of souls both living and dead. We’re all ghosts in the machine, unable to connect. Pulse has had a frustrating distribution history in the United States. In a story that will sound all too familiar for long-time genre enthusiasts, the Weinsteins quickly snapped it up in order to secure the remake rights and promptly shelved the original for four years. Eventually, it surfaced after said remake was released, by which point the J-Horror trend had begun to wear out its welcome a bit. At such, Pulse felt like a belated also-ran before it began creeping under the radar, slowly but surely gaining a cult legion. That familiar arc has now culminated in a terrific collector’s edition Blu-ray from Arrow Films, which boasts the usual sterling, high-definition presentation and loads of supplements. Both Kurosawa and Hayashi appear in separate 40-minute long interviews where they discuss their careers in general before tackling their work on Pulse specifically. Kurosawa goes deep into his past, explaining how he moved through the pink movie ranks to eventually start directing his own films, as well as the (rejected) overtures made by American studios. Another interview on the disc features modern horror masters Adam Wingard and Simon Barrett, who discuss their personal histories with Kurosawa’s films and how those efforts have inspired their own work. There’s some great stuff here that will speak to genre fans who can recall what it was like to have to hunt down sketchy VCD copies of these J-Horror imports at conventions. That’s obviously a far cry from this spectacular edition, which also features archived supplements, including a 40-minute behind-the-scenes promo, footage from the film’s Cannes premiere, trailers and TV spots, and newly commissioned artwork from Tommy Pocket. This edition’s first pressing will also include an illustrated collector’s booklet featuring writing from critic Chuck Stephens. A release from Arrow has the air of an induction of sorts, and Pulse is certainly fully deserving of ranking among the canon of great horror films. Few films are as utterly haunting, and revisiting it after all of these years has left me shaken by its tremendously upsetting, almost casual brand of nihilism. There’s been some (wrong-headed) writing recently that insists horror movies are somehow just now becoming great because they’re exploring weighty themes of existence and whatnot. In a move that smacks of ignorance, they’ve even labelled this stuff “post-horror,” a term that basically shakes off a century of terrific genre output. Maybe someone should send these folks a copy of Pulse—while it wasn’t the first horror film to tackle the enormity of existential despair, it is most certainly among the most effective.